When she was built as Tor Britannia as the first of two sisterships for Tor Line, the later Prince Of Scandinavia was the largest ferry ever built for European service. In the rest of the world, only the ferries of the Sovjet Belorussia-class were somewhat larger, though not much. She was launched at the 10th of october 1974 from the Flender Werft in Lübeck, situated in the former East German Republic under yardnumber 607. She measured some 22.528 tons and that made her just as large of several cruiseships built in the same period. Her lenght was 182,35 meters and she was 23,63 meters wide. Her draft reached 6,20 meters and she had accomodations for 1592 passengers in cabins, 143 crewmembers and around 379 passengercars on eight decks. She was also one of the fastest passengerships afloat, designed for a speed of around 27 knots. Tor Line itself was established just a few years earlier, in 1966 for a service between Sweden, England and The Netherlands and they swiftly led competition behind, being the only company offering this service in the early 1970's. To further strengten the route, Tor Britannia and her sister Tor Scandinavia were built. In design, both ships were not like any other ferry in service, as they more or less resembled an oceanliner or a cruiseship then other ferries. They were even built with a swimming pool midships and a large amount of sunbathing space on classic stepped-back aft decks. A good proportioned superstructure, large funnel just aft of the pooldeck and quite a long forecastle make these ships, still today, look splendid, especially if you consider they were only intended as ferries for northern European service. Below, Prince Of Scandinavia leaves IJmuiden harbour at the 26th of june of 2003 as a DFDS Seaways ferry sailing for Newcastle. Her original Tor Line service was the one between Göteborg in Sweden to Harwich, England starting the 16th of may 1975. On the way back, she had also a stop at Amsterdam. For this, she had to sail really to Amsterdam over the Northsea Canal, because her terminal was located in the western port of the city. IJmuiden, where her terminal was located in her later DFDS service, was passed. This meant that she had to sail past the IJmuiden locks and then up to Amsterdam, adding around two hours to the journey one-way. The ship also sailed the route between Göteborg and Immingham, mostly from 1976 onwards. But building two of the largest ferries afloat had been a little too much for Tor Line, as they faced hard times filling the both ships. Tor Britannia kept sailing the route's, while her sister was used as an expoship from 1979 onwards. Tor Line started to combine with the Swedish company Sessan Linjen in 1980 and the company was restyled Sessan-Tor Line. The Sessan logo, a mermaid, was added to the ships funnels next to the Tor Line logo. This was only short-lived, as the combination ended in early 1981 and Tor Line was bought by the Danish giant DFDS. For them, her role was to change as she was marketed under the name of Scandinavian Seaways, a name that had been started up for the exciting new venture by DFDS of sailing one-day cruises from Florida. Being built in the style of the cruiseliners of the 1970's, this prooved possible, the new management must have thought. She got the new name of Scandinavian Star for this and was to sail for Florida, which she didn't. Instead, the ship was laid-up in november of 1981 in Copenhagen and her sister kept sailing the former Tor Line route under the banner of DFDS Tor Line. From march 1982 onwards, she again recieved her old name Tor Britannia for DFDS Tor Line and started up her original route again, one year later this was changed to the route between Esbjaerg and Harwich. She also was considerably smaller now, measuring just over 15.000 tons due to new measurement systems. Esbjaerg to Harwich was her main route in the 1980's and she sailed this route without too much interuptions untill 1990, when DFDS restructured their Northsea services. Now, they were brought under the banner of Scandinavian Seaways, the old name that was originally planned for the Florida venture. All passengerservices were to continue under this name and now she also lost the Tor Line name herself. After a rebuilding at the wharf of Blohm & Voss in Hamburg, Germany, she emerged as the Prince Of Scandinavia. This was the new naming style of the passengerliners within the fleet of DFDS and she also was now homeported at Copenhagen, the home-base of DFDS. The rebuilding had taken place between november 1990 and january of 1991 and after that, she returned to her route at the Northsea. From 1994 onwards, she took up station at IJmuiden for a service between IJmuiden and Kristiansand, but this was only for a short while as she was laid-up at Göteborg in october of 1995. The ship was chartered to COTUNAV of Tunesia for a service at the Mediterranean, where of course her pooldeck was a great extra touch. For them, she sailed the route between Tunis and Mrseilles, France or Genoa in Italy in 1996. From february 1997, she again was part of the Scandinavian Seaways fleet, being placed on the route between Hamburg and Harwich and from 1998 onwards she also sailed the route between Hamburg and Newcastle. 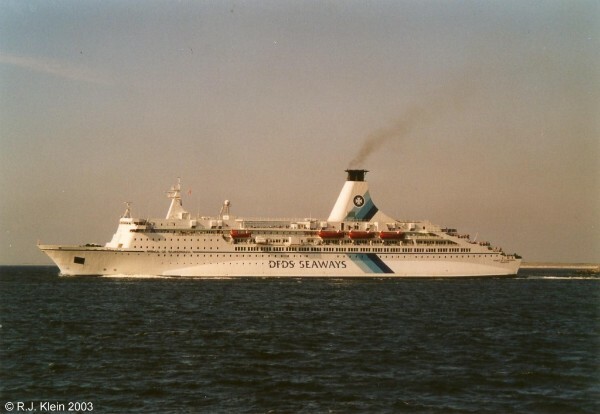 In 1999, DFDS lost the Scandinavian Seaways name in a restructuring of their services so now it was named DFDS Seaways and as a result, the name on the hull was also altered. At the 28th of january 2001, the ship took up the service between IJmuiden and Newcastle. But this was only for a few years, because DFDS was trying to lower the average age of their passengerfleet. The ship was about to enter her thirthieth birthday and considered too old now. At the 27th of november of 2003, Prince Of Scandinavia was therefor sailing her last crossing from Newcastle, before she was sold to Moby Lines of Italy as Moby Drea. For Moby, she took up the service between Livorno and Olbia untill 2007, when she started up the route between Genoa and Porto Torres.